For CGSW our geographical “field” is very wide. We conduct research, training, and monitoring and evaluation projects all around the world. However, we also lead and participate in various outreach activities in the U.S. and abroad that highlight our commitment to raise awareness and educate others on emerging and important WASH issues. Our activities range from large group events on the Emory University campus to presentations at local community meetings to educating schoolchildren and young adults about important WASH issues. See the stories below to see just a few examples of what CGSW is doing “in the field”. WASH graduate, Gloria Sclar (MPH ’15), was one of the featured speakers at the dedication ceremony of Emory University’s new WaterHub. Emory’s new WaterHub is the first of its kind in the country, using eco-engineering to recycle up to 460,000 gallons of water per day, creating lower cost water at a long-term stable rate and saving Emory millions of dollars in water utility costs. In addition to recycling water, the WaterHub includes a Reciprocating Wetland demonstration unit which creates opportunities for water testing and research by faculty and student members of the CGSW. 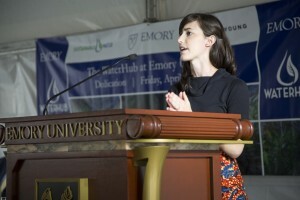 Click here for more information about the new WaterHub at Emory. Each year, The Friends School of Atlanta celebrates Human Rights Day, based on the United Nation’s 1948 Universal Declaration of Human Rights. For 2014, the school examined the human right to water as indispensable for leading a life in human dignity. 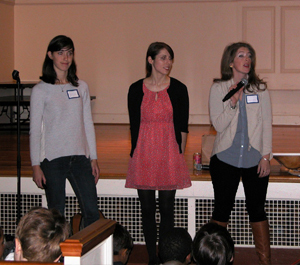 Three representatives from the CGSW, Gloria Sclar (MPH ’15), Mary McGillicuddy (MPH ‘16) and Mia Gallegos (CGSW Program Associate), gave a presentation to several hundred children on what it means to have access to clean and safe water and implications of not having clean water. 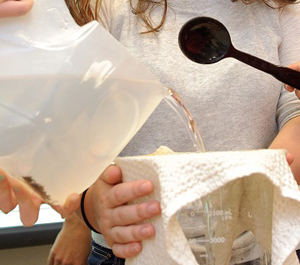 “Would you drink the water out of your toilet?” That was the question posed to a group of 8th graders at Renfroe Middle School by WASH graduate student, Melissa Sizemore (MPH ’15). Melissa was one of the 15 local presenters at the 2014 WaterWise Symposium in Atlanta, Ga. Several hundred middle school students broke up into small groups to learn from and work with local presenters to examine scientific, cultural, social, logistical and personal perspectives in global water resources. Melissa’s presentation required students to compare wastewater treatment processes in their hometown (Atlanta) to those in Accra, Ghana and learn what it means for water to be “safe”. The presentation concluded with a demonstration of the LifeStraw water filter, highlighting technology’s ability to provide safe water from questionable sources (in this case, toilet water). A study completed by CGSW Faculty Dr. Amy Kirby has had some interesting effects at the Hartfield-Jackson International Airport, one of the world’s busiest airports. 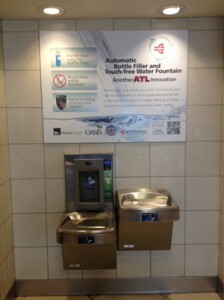 In 2013, the Airport began installing automatic water bottle fillers in the water fountains throughout the airport. As part of this retrofit, the exterior surfaces of the fountains were changed from stainless steel to MD-Cu29 Antimicrobial Copper. This included the water basin, the front, and the sides of the fountain. Over the course of 90 days, Amy Kirby and her team collected swab samples from fountains throughout the airport to determine if there were any notable changes to bacterial load with the new installations. Results showed antimicrobial copper fountains reduced mean total bacterial contamination level by 81.6%. With the installation of the new fountains, CGSW is literally “on the scene” as our logo and study findings are prominently displayed on VERY large placards throughout the airport!